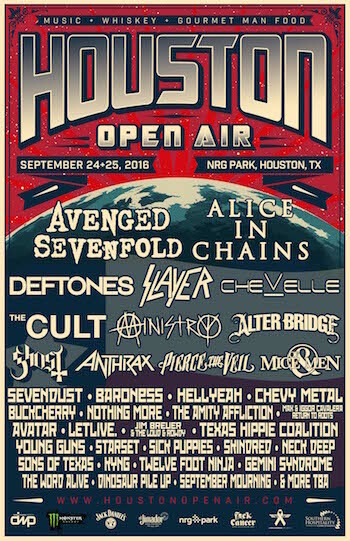 Avenged Sevenfold and Alice In Chains top a lineup of over 35 bands for the first-ever Houston Open Air—fueled by Monster Energy—held Saturday, September 24 and Sunday, September 25, 2016 at NRG Park in Houston. The biggest rock experience in Texas—produced by Danny Wimmer Presents—will also feature performances from Deftones, Chevelle, Slayer and many more on three stages, plus Jack Daniel's Old No. 7 Whiskey Row and Gourmet Man Food. Danny Hayes, CEO, Danny Wimmer Presents says, "Houston Open Air has been in the works for almost a year now. It's awkward to announce a major music festival in a city that has experienced such recent hardship and, in fact, we delayed our announcements out of respect for what Houston has endured. But at the same time, our festivals are about highlighting the strengths (or sometimes the needs) of our host city. There's no more important way to do that right now than to support Mayor Turner's efforts to help Houston recover from this spring's flooding and we will be incorporating this message throughout our launch campaign." Danny Wimmer, Founder, Danny Wimmer Presents, add, "Houston is one of the country's biggest rock markets and, when combined with the impressive food scene happening here, it's a natural location for a DWP festival. We're thrilled to have such a diverse first-year lineup that includes Avenged Sevenfold, Alice In Chains and Chevelle. With the inclusion of an incredible food experience and the Jack Daniel's Whiskey Row, we are kicking off a powerhouse experience that will live in the market for many years to come!" 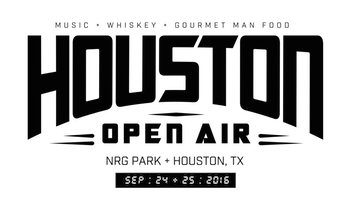 In addition to three stages of top rock bands, Houston Open Air features the celebrated Jack Daniel's Old No. 7 Whiskey Row, and a Texas-sized Gourmet Man Food experience underscoring Houston's emergence as a great American food city.